If we had a nickel for every time someone said the phrase ‘money can’t buy style’ we’d be rich enough not to worry about whether or not said money bought style. However, there’s more than a grain of truth in this overused but well-intentioned phrase. While all stylish men may not share six-figure salaries, they do all understand that the smallest details can have the biggest impact. In short: you don’t necessarily have to be rich to pull off advanced style moves. To save you the effort (and potential awkwardness) of scrutinising the whims of well-dressed men, we’ve put together 20 subtle upgrades that will instantly improve your sartorial standing. For teenagers, it’s practically sacrilege to be seen with a school shirt tucked in. But this year, the menswear elite are tucking in pretty much any clothing they can get their fashion-hungry hands on. A tucking novice? Try the front-tuck, which involves placing only the front of a T-shirt or shirt beneath the front of the trousers’ waistband. Or for a next level move, tuck a T-shirt or polo shirt fully into a pair of chinos or tailored trousers for a smart, neat finish. If you’ve gone tucking mad, there’s always the option of moving on to experimenting with pieces such as lightweight knits and track tops. Even if the nine-to-five doesn’t require one, chances are you’ll need a tie for a wedding, party or similar event at some point, so it pays to be armed and ready. Instead of going with a plain silk example, opt for a more modern knitted design, which will add texture and individuality to a look while still keeping things classic. Like clothing, the hair world offers up a few choice trends each season. However, mops should primarily be driven by the mugs they sit on top of. Guys with long faces shouldn’t add too much length on top or go short on the sides. Those with rounder faces, meanwhile, should try to balance their curves with shorter sides and height on the top. Similarly, facial hair should add length to rounder faces and be worn cropped on those with longer faces. In short: a classic haircut that is right for the wearer will always look better than a trending hairstyle on someone it doesn’t suit. It goes without saying that all suits, regardless of price, benefit from slight adjustments. Less commonly known is that it isn’t just tailoring that benefits from the personal touch, though. There’s a whole host of other wardrobe staples capable of an instant upgrade when moulded to your body shape. Shirts, T-shirts, jeans, trousers – if you can wear it, it can be nipped, cut and tucked to achieve a range of effects, including making a frame appear taller or thinner. When not shielding your eyes, there’s only one place for sunglasses – and it’s not on top of your head or, worse, on your neckline. “Looking around Pitti Uomo, the way to carry sunglasses is to put them in the breast pocket of a blazer or jacket and just leave one arm hanging out on show. 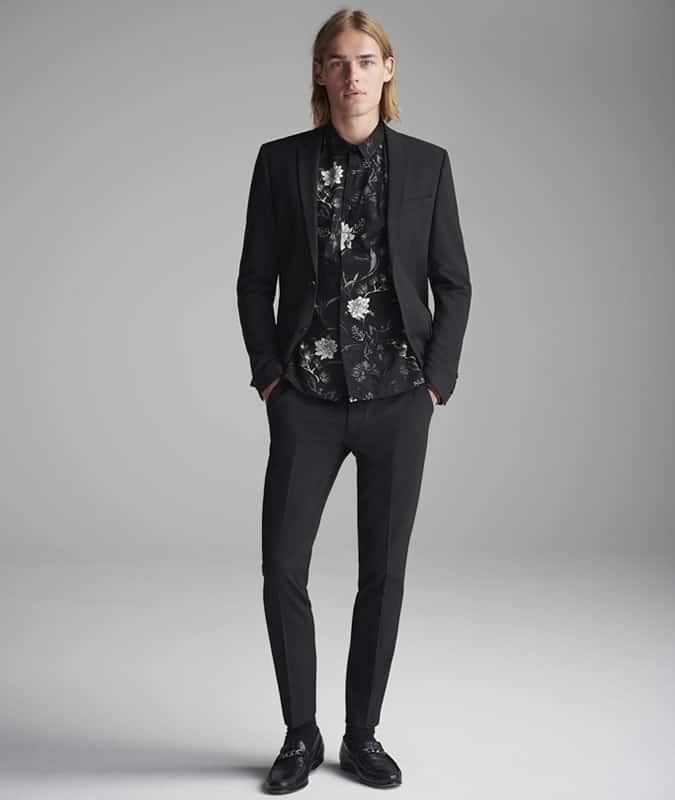 Subtlety is key,” says Reiss head of menswear design Alex Field. The beauty of white sneakers is that they go with pretty much anything and everything (not to mention ticking off that high-low look). The downside? That means they’ll probably be on your feet more often than not and will show every last mark from their travels. The best way to avoid them looking too battered and bruised is to regularly treat them with a fabric protector spray (prevention is better than cure), swap out old dirty laces for fresh ones, and take a toothbrush and soapy water to pesky stains. Former glory = restored. A quick Google search will unearth a surprising number of cyber-inches given to the merits of selvedge denim – denim purists care, a lot. But all you really need to know is that selvedge denim is best worn turned up. In-keeping with menswear’s increasingly relaxed mood, traditional collared dress shirts are being shunned for more neck-friendly alternatives. When it comes to initial attraction, research has – surprisingly – proved that smell is more important than looks. And who are we to argue with cold, hard, fragrant facts? The perception of a pleasant scent causes overall positive evaluation in both men and women, resulting in superficial flaws being more readily overlooked. It seems like it’s time to cancel that gym membership and stock up on some all-time classic scents. Relaxing office dress codes and the rise of ‘business-casual’ has caused the ‘air tie’ to become the go-to move for men wanting to make a statement. If that’s not an option, go in the other direction with a collar bar, which makes your choice of tie (knitted, we hope) more prominent while introducing an additional accessory. Equally, if going sans-tie has left the shirt’s collar looking a bit lonely (or awry), try the bar on its own. Less restrictive and undoubtedly shinier than a knot at the neck, it’s perfect for going from the boardroom to the bar, without breaking a sweat. Unless your surname is Gosling (and even then), no one wants their dad to be unintentionally more stylish than them. So follow the advice of MatchesFashion’s men`s style director, Simon Chilvers, and pull on some light-wash denim, pronto. The only thing worse than that commuter on the train oblivious to those dispersed by his backpack is an aforementioned commuter who hasn’t bothered to upgrade his backpack. If headed out on a hike, a sports backpack is perfectly acceptable. If headed to the office, it’s time to sharpen up. A neat leather example offers the same practicality but will ensure your look is more slick than sweaty. Cost-per-wear sounds like a rather tight-fisted approach to getting dressed, but in fact getting the most out of something is the best way to ease buyer’s remorse and justify splashing out. Making use of a blazer, particularly one that’s unstructured, outside of office hours is an easy way to sharpen up any look, says Jaeger’s head of menswear, James Jee. Mad Men is finished, Don Draper’s gone on holiday to a Californian hippie retreat, and your tailoring (like his) should now follow suit. After a certain age, all men have to face facts and accept that a hefty dousing of Lynx Africa does not constitute a grooming regime. Invest in a bathroom cabinet that will make your face look as presentable as your clothing. Ditch drying soap and water and instead opt for a gentle everyday cleanser. Exfoliate twice a week to slough off dead skin and use an SPF moisturiser daily to hydrate and keep UV rays at bay. Lopped off hems have practically become the new norm when it comes to trouser length, and unbelievably peak ankle bearing has not yet passed. There was once a time when everything was clearer: men wore suits during the week and changed into T-shirts on the weekend. But today, menswear’s tectonic plates have shifted, and now (almost) anything goes. This is most evident in the rise of high-low dressing, where formal (high) and casual (low) pieces are combined to surprisingly stylish effect. Think tailoring worn with a track top and sneakers, or slimline joggers paired with a smart coat. If it feels like an odd pairing, these days, it might just work. We’re willing to wager that headphones are the last thing most people expect to see on a rundown of men’s fashion upgrades. Yet ignore this small, but not insignificant, detail and watch your style stock plummet. Standard-issue earbuds have an uncanny ability to tangle, fray and attract dirt like nothing else. Shop smart and look better in the process by investing in premium cans that use materials like leather, aluminium and brass, which stand up to rough and tumble without showing it. It isn’t just angry adolescents sticking two fingers up at society by wearing distressed jeans. The (artfully) lived-in look is now a common way to get in tune with menswear’s best dressed. Don’t pay for the privilege, though. Grab a pair of old jeans and take scissors to each knee, or cut off and fray each leg’s hem. Job done. The gilet at first doesn’t appear to make a whole lot of sense: designed for insulation but missing arms, it even has its own spectacularly unsexy nickname (bodywarmer, in case you were wondering). Slip a lightweight version of this once terminally unfashionable item over or ever under a suit jacket, however, and you’ve just turned ordinary office garb into the most menswear-approved way to wear tailoring.